City of Minneapolis Funds for efficiency projects, 2016 Benchmarking Report, upcoming webinars, events and more! Restaurant owner Ruhel Islam shaved $1,900 off his annual energy bills. How? With the help of the Minneapolis Green Business Cost Share program, Ruhel installed an energy efficient ventilation hood in his kitchen to save him money and energy spent on excess ventilation as well as make the kitchen more comfortable for employees. Hear Ruhel share his story in this video. The City of Minneapolis is committed to help local businesses save money and reduce environmental impacts through the Green Business Cost Share program. The program offers businesses with matched funds up to $100,000 to help finance energy efficiency and renewable energy projects. Funding priority will be given to businesses in Green Zones of Minneapolis, buildings participating in the Minneapolis Energy Benchmarking program and Building Energy Challenge. The next application deadline is April 1st, and projects will be selected while funds last. Click here to download the application. 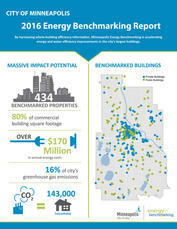 In the fifth year of commercial building benchmarking, the 2016 Minneapolis Benchmarking Report shows promising trends in commercial energy and water use. Although the square footage of commercial properties increased from 2014 to 2016, weather-normalized energy use intensity (EUI) and water consumption decreased 1.7% and 5.9% respectively. Parking garages demonstrated the greatest energy savings, dropping 36% over the three years. Other commercial sectors are still rife with potential savings. Read the full report to analyze public and private building energy trends, review case studies, and identify future opportunities to save energy and gain building recognition. The City of Minneapolis' data request link is now available for commercial buildings 50,000 square feet and over and public buildings 25,000 square feet and over to submit their 2017 energy and water use data to the City by June 1, 2018, as required by the City's Energy Benchmarking ordinance (Title 3, Chapter 47.190). When air leaks throughout the ductwork of commercial and industrial buildings, energy is wasted to increase fan power and condition the space. Research partners Aeroseal and CEE teamed up to study the efficacy and cost of aerosol sealant for duct leaks. In the buildings studied, the research found that air ducts had an average leakage rate of 29%, but that aerosol reduced leakage by over 90%. For more information about the energy savings and payback for aerosol sealing, read the report or Aeroseal's infographic, or register for a webinar on March 29th to learn more. The Urban Land Institute (ULI) has developed a ten-step design and construction process to help commercial building tenants save 30 to 50 percent on energy bills. The Tenant Energy Optimization Program helps building owners and tenants identify ways to cut energy spending, with payback periods of three to five years, and average a 25 percent internal rate of return (IRR). Learn more about the process on ULI's website. CenterPoint Energy recently selected a consultant to develop a whole building energy data aggregation tool (EDAT). The purpose of the EDAT project is to facilitate data access and benchmarking capabilities for multi-tenant building owners while protecting privacy. The objective for CenterPoint’s tool is to automatically aggregate energy use data and allow it to interface with ENERGY STAR Portfolio Manager®. Please RSVP to Ethan Warner (ethan.warner@centerpointenergy.com) if you would like to attend. Refreshments: Coffee and snacks will be provided to participants at the meeting. 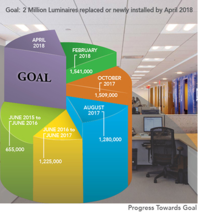 The Interior Lighting Campaign (ILC) is organized by the U.S. Department of Energy, Illuminating Engineering Society, Building Owners and Managers Association, International Facility Managers Association, and U.S. General Services Administration. The ILC recognizes energy efficient lighting practices for interior lighting (troffers, linear, high and low bay). Outstanding facilities are recognized for their efforts. For more information, visit the ILC website, or submit an entry for the award here. Sign up for Level I Building Operator Certification Training! Want to improve the comfort of your office while simultaneously improving the efficiency of your building? Sign up for Minnesota's Building Operator Certification (BOC) training series, located in Maple Grove, MN! BOC is a nationally recognized training and certification program focusing on energy efficient building operations and preventative maintenance procedures. Standard tuition is $1,695, but discounts and incentives are available. The training includes 74 hours of project work and class time, held from 8 am to 4 pm.